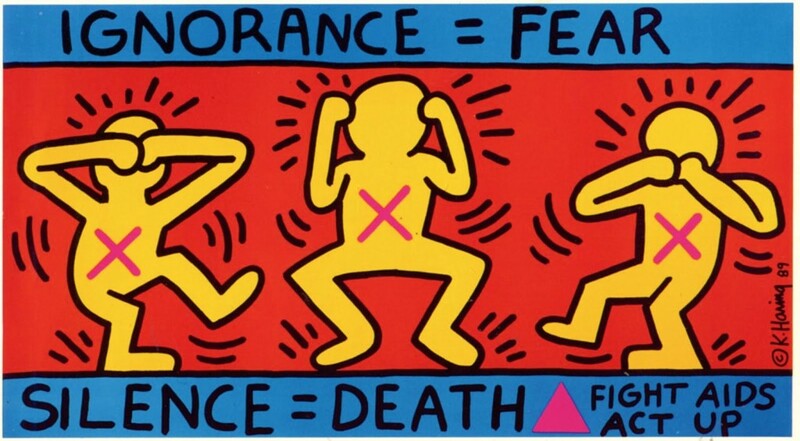 Keith Haring was diagnosed with HIV/AIDS in 1988. A couple of years ago, I was making plans for my semester abroad; I was going to study at the University of Wisconsin in Madison (go Badgers! ), and it was time for me to decide which classes I wanted to enroll in. I had only one condition: I wanted to take at least one class that I would never be able to find at my own university. When I spent a semester at the National University of Ireland in Galway, I had enrolled in Irish Women’s Poetry. So what did Madison have to offer that my home base didn’t? By the end of the afternoon, I had narrowed down the list to two options,, Ghetto Literature and Literature and HIV/AIDS; on a whim, I picked the latter. Literature and HIV/AIDS turned out to be one of the most fascinating classes I had ever taken, and I cannot even begin to tell you what an impact it has had on me. Being introduced to Angels in America alone was a lifechanging moment, as was watching the mini series with my roommates. At the end of the final lecture, students lined up to hug the professor and thank him for the experience. * I sent my mentor back in the Netherlands an e-mail and told her that I wanted to write my MA thesis on American AIDS literature. I also started a monthly donation to the largest Dutch HIV/AIDS charity, which I still support to this day. In this post, I have made a selection from the (very, very long) resource list I had compiled while working on my MA thesis. Since my research was on works written by queer authors during the American HIV/AIDS epidemic during the 80s and 90s, that is mostly the focus of this list as well. It is far from complete, but it is a good place to start, I think. Of course I don’t expect you to read every work I’ve listed, but personally, I would strongly urge you to pick up either Tony Kushner’s Angels In America or Mark Doty’s Heaven’s Coast. These are voices that need to be heard. *The professor’s name is Colin Gillis., the course code for Literature and HIV/AIDS is English 474, and Gillis also teaches Queer Narratives, another class I thoroughly enjoyed. Get on that, Badgers.